A few weeks ago I made macarons for the first time ever. I was blown away by how much easier they were to make than I expected. For some reason I just had this instinctive fear of making them, but it proved to be unfounded. Other than the fact that it's sort of annoying to get the food processor out, they really aren't that hard at all. Anyway, since then I've been in a macaron frenzy, making all kinds of crazy flavors. This time, since I already had the mixer and food processor out, I made three different flavors. One to post this week, then two to save for lazy weeks in the distant future when I don't feel like baking for you guys. Just don't be too surprised if "distant future" end up meaning "the next few weeks". I just hope you all like macarons. Grind the walnuts in the food processor until coarse. Measure the ground walnuts so that you have 2/3 cup. Add the powdered sugar to the 2/3 cup ground walnuts and continue processing until fine. Sift through a fine mesh sieve. Beat the egg whites until frothy. Add the granulated sugar 1 tablespoon at a time until fully incorporated. Continue to beat the egg white mixture until glossy and stiff peaks form when you lift the beaters. Gently stir in the vanilla extract. Add half of the sifted walnut mixture, and gently fold it into the meringue using a flexible silicone spatula. And the remaining walnut mixture and continue gently folding. Pour batter into a pastry bag fitted with a 0.4-inch tip or a plastic baggie with a corner snipped off. On your prepared baking sheets, pipe out 1-inch circles. Holding the cookie sheet with both hands, smack it against your countertop a few times to help the batter settle and even out. This also helps get the elusive “feet”! 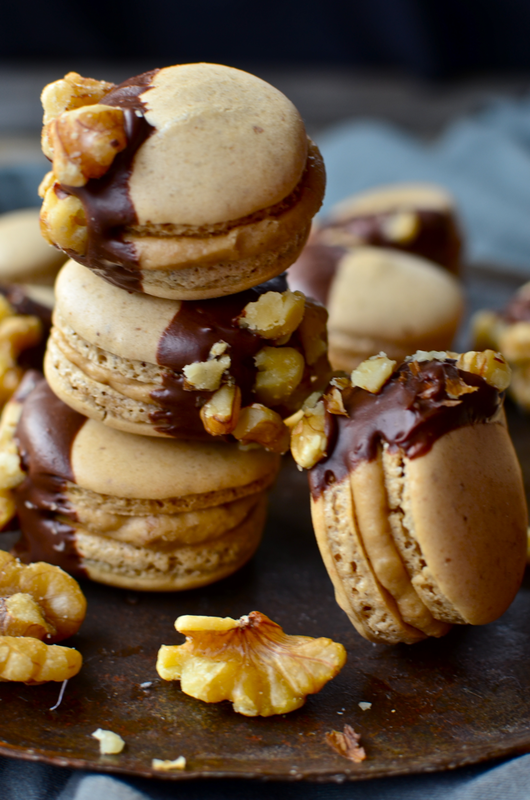 Let the piped macarons sit out for at least fifteen minutes to help build a slight film over the top. 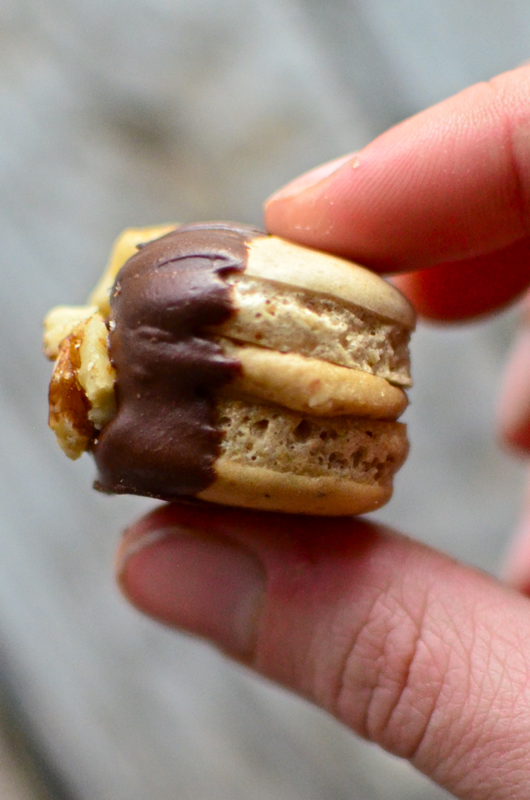 After 15-20 minutes, check the batter by lightly tapping your finger on the top of a macaron. Your finger should bounce off the top without anything sticking to it. If they’re still sticky, allow to sit out for up to an hour! Grind the walnuts in the food processor (make sure they're smaller than whatever tip you are using for piping). Beat the butter until smooth. Alternately add the syrup and powdered sugar until desired consistency is reached. Add the extracts. Stir in the nuts. 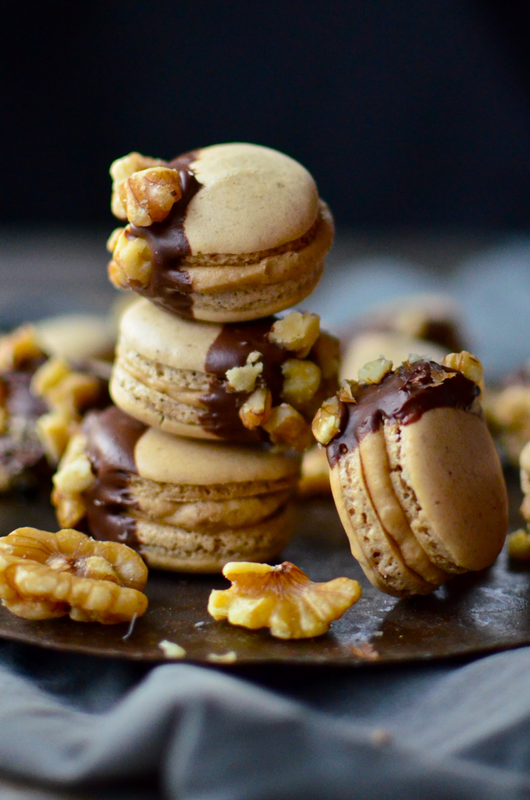 Pipe onto cooled macarons and sandwich them together. 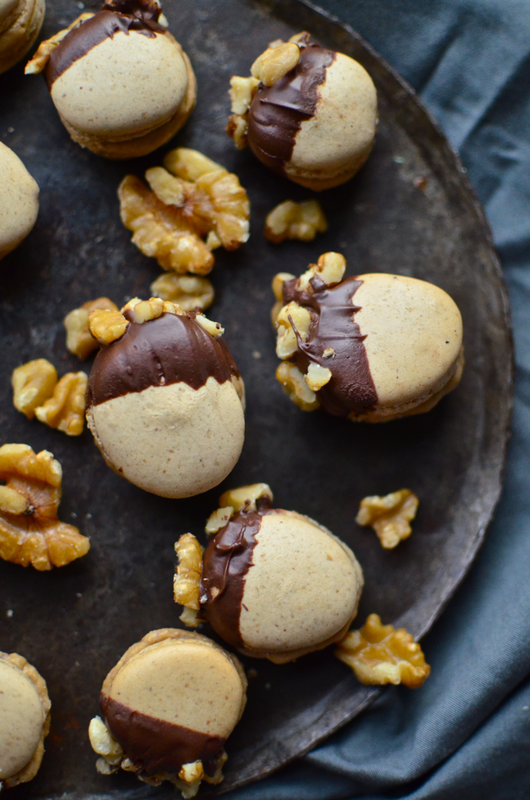 I dipped them in melted chocolate and crushed walnuts, but you don't have to!